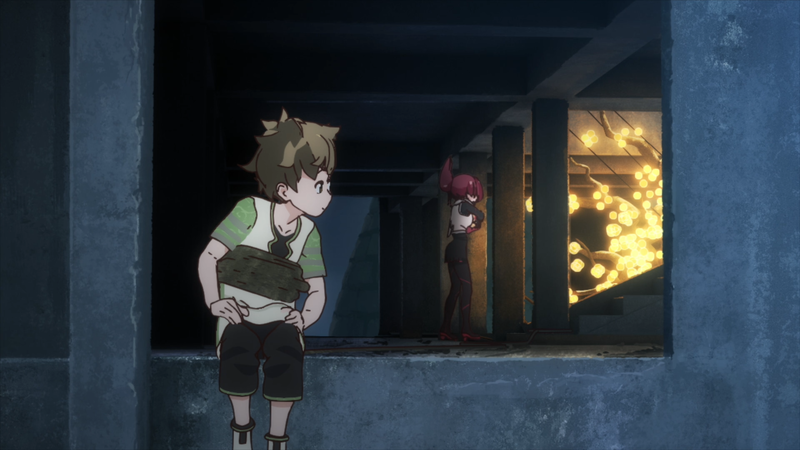 This episode of Kemurikusa is just Rin and Wakaba bonding and I haven’t found either character all that interesting so I was frankly really bored throughout this episode. The ending gets my attention a little bit since the group decides to travel to a new location though why that excites me is simply that I’m hoping the scenery will change from a bunch of badly-rendered abandoned buildings in the night sky. At least Kemono Friends had brighter colors. It’s possible I’ll drop this series at Episode 3. Not only is it too dry for my liking, it also feels too similar Kemono Friends and I say that knowing Tatsuki’s original concept precedes that show. Maybe Tatsuki and Kemono Friends was the right combination of muse and artistic voice. A damn shame then that these two had to go their separate ways. 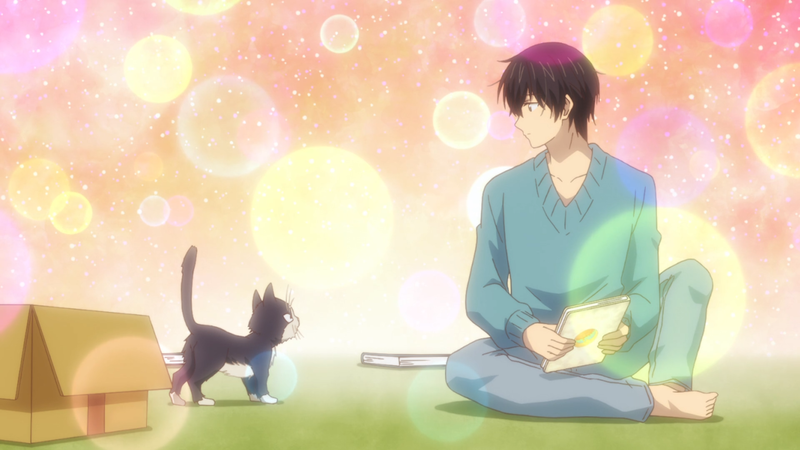 You know, it didn’t occur to me that Subaru had yet to name the cat Haru until now…and I accidentally put the name in my First Impressions post…sorry for spoiling? Joking aside, the scene where the two characters settle on “Haru” was very heartwarming. It initially seems silly that Subaru doesn’t want to name his cat but given the loss of his family, you get why he’s afraid of feeling too attached. Watching him try and even find the right name just feels right as a result. Once again, we get to see the same situation from Haru’s perspective and as expected, she interprets things much differently than Subaru. It looks like this is the weekly format the show is adhering to but I’m okay with that for now since it’s been fun so far. Finally, The Price of Smiles focuses on its other main character. 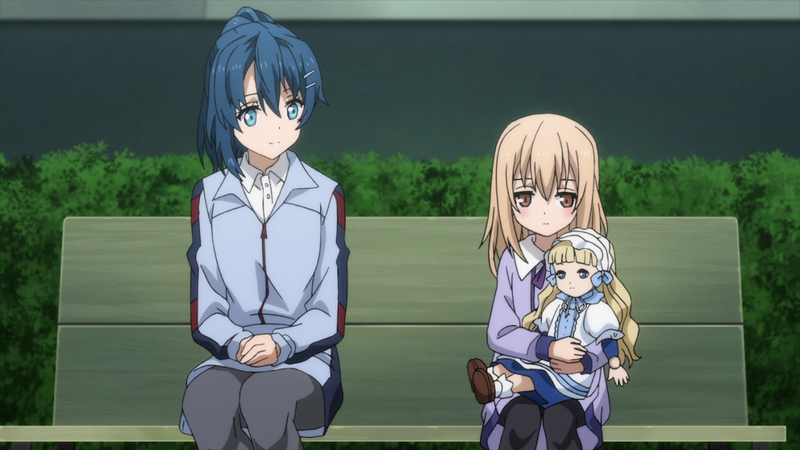 I was afraid I was maybe wasting my time with waiting to see what the deal is with Stella but fortunately, I found her to be a really interesting character. There seem to be some compassion left in her but evidently, the war has left her severely jaded. You see that at play here when her commanding officer Gale, tries to convince some orphans to abandon a building their squad has to blow up and Stella threatens to use force if they don’t comply. You later find out she was simply using a scare tactic but it’s still a very questionable decision that shatters whatever good will she had with the already contemptuous orphans. Worse is that you see her shrug the experience off with a smile, possibly trying to lie to herself to keep her composure (provided that she hasn’t already lost it). 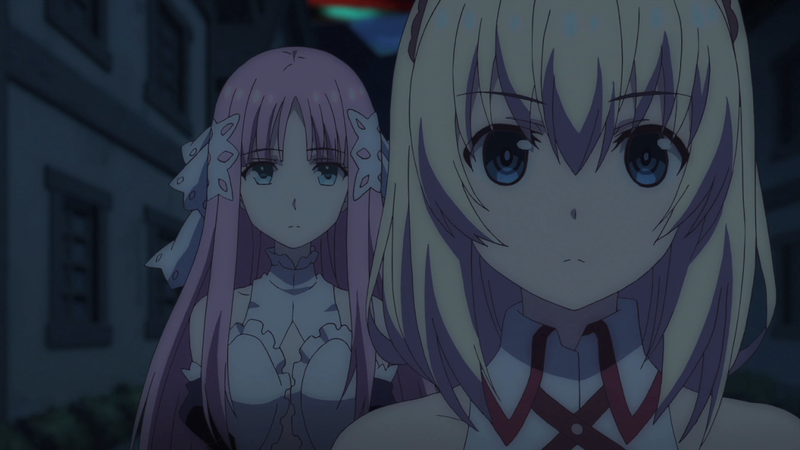 This attitude on display does make me really curious what happens when Stella meets Yuuki. It’s such a huge contrast to the princess’s naivete. How would these two meet though? At one point, Stella tells Gale that she’d accept a mission to assassinate the princess if it meant ending the war. Was that foreshadowing on the writer’s part? The first episode was just decent at best but still to my disappointment, the second episode is a slog. The protagonists meets Don Quixote this time around and that’s fine and all but the legend is played pretty faithfully. There’s no crazy spin given like with Red Riding Hood. Speaking of which, I have mixed feelings about seeing Red Riding Hood now as another form Ex can take during combat. I don’t know, it feels a bit demeaning when all your supportive characters ultimately amount to mere power-ups for someone else. I’ll try Episode 3 but this is looking to be a drop. Officially available on Crunchyroll, Funimation, Hulu. Maybe I just don’t get it. I mean, I still find Kaguya-sama pretty funny. The switcheroo during Kaguya and Miyuki’s argument over the student council’s summer trip and Miyuki’s ridiculous attempts at giving romantic advice (that actually pays off for the recipient) do garner a laugh here and there. And yet, I’m watching it and I ask, “Is that all there is to it?”. Is it all just variations on Kaguya and Miyuki’s romantic stalemate? If so, maybe this show would’ve been better off with a shorter run time because it’s proving to be very repetitive. The visuals are admittedly stylistic but that sometimes can only keep a show fresh for so long. At least Fujiwara remains the best part of the show. I’d demand a spin-off starring her but it’s clear that she works because she is the third wheel character, oblivious to what’s going on with her peers and incidentally throwing both off their game on a consistent basis. 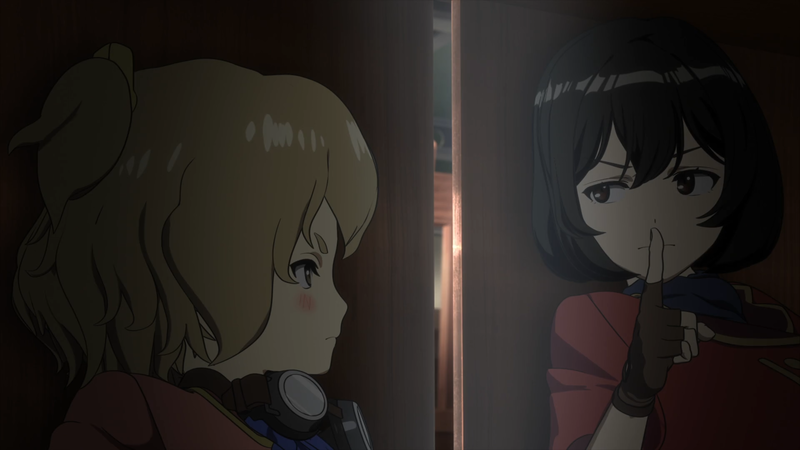 I want to say this is where The Magnificent Kotobuki starts establishing its characters and to be fair, you kind of get a grasp on certain parts of the their team dynamic, such as the heated rivalry between Kirie and Chika. That said, if you asked me the names and personalities of every main character, I probably couldn’t answer in sufficient detail. Hell, I don’t think I could really explain what the deal was between Loulou and her client Julia. I guess they have some rough history together? It’s worrisome and yet I strangely find myself still curious about this show. The aerial combat is still fun to watch and this weird Western meets Steampunk(ish) art style is simply fantastic despite the rough CGI animation. Also, that OP. God bless you, ZAQ. There’s enough to warrant a little bit more investment out of me but hopefully, the characters and story will still pull through. 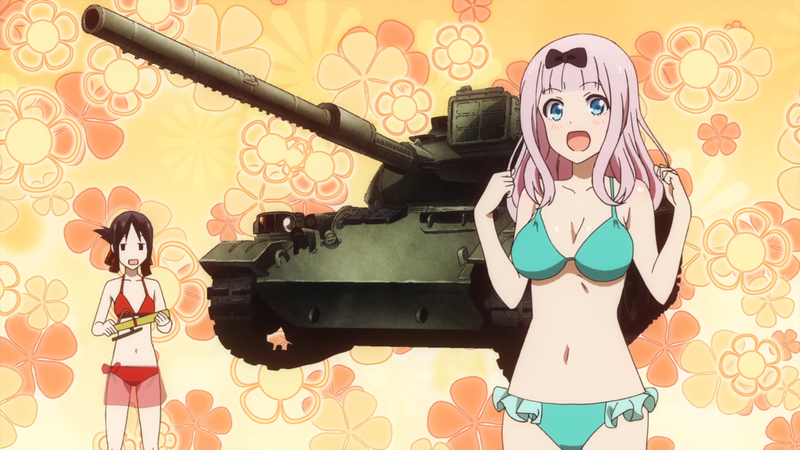 This entry was posted in Anime, Episode Reviews, Lightning Rounds and tagged A-1 Pictures, Action, Adventure, Airplane, Anime, Brain's Base, Comedy, Egao no Daika, Episode Reviews, Fairy Tale, Fantasy, GEMBA, Grimms Notes the Animation, Kaguya-sama wa Kokurasetai: Tensei-tachi no Renai Zunousen, Kaguya-sama: Love is War, Kemurikusa, Kouya no Kotobuki Hikoutai, Lightning Round, Magic, Mecha, Military, My Roomate is a Cat, Pet Cat, Post-Apocalyptic, Psychological, Romance, School, Sci-Fi, Seinen, Slice of Life, Tatsunoko, The Magnificent Kotobuki, The Price of Smiles, Yaoyorozu, Zero-G. Bookmark the permalink.